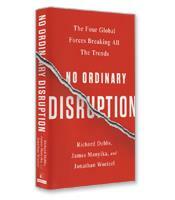 Based on years of research by the directors of the McKinsey Global Institute, No Ordinary Disruption: The Four Forces Breaking all the Trends is a timely and important analysis of how we need to reset our intuition as a result of four forces colliding and transforming the global economy: the rise of emerging markets, the accelerating impact of technology on the natural forces of market competition, an aging world population, and accelerating flows of trade, capital and people. Once upon a time, a company such as Toyota used to have strict retirement requirements tied to age. Employees knew that once they reached the cut-off age, they would be asked to retire. No exceptions. The shifting locus to emerging markets and specifically the cities within those markets. Half of the global GDP between 2010 and 2025 will come from 440 cities in emerging markets. Some of them will be well known, such as Shanghai, but most will be small- and medium-sized cities most have never heard of. The acceleration of the scope, scale and economic impact of technology. It’s hard to believe that technology could accelerate even more than what we’ve seen in the past 25 years (a paltry 3 percent of people in the world had a mobile phone 20 years ago). However, companies such as Alibaba and Uber show how quickly technology can redefine industries. The global interconnectivity through movements (or “flows”) of capital, people and information. The original lines of connectivity between Europe and America have evolved into a “complex, intricate, sprawling web,” the authors write. These four global forces are breaking all the trends, according to the authors. As a result, people and companies are going to need what they call “intuition resets.” The old assumptions, habits and priorities have to be replaced with new ones. Thus, Toyota starts a reemployment initiative for older workers, as described above. Companies are discovering the power and reach of the exploding technology to “create difficult-to-replicate capabilities,” the authors write. One example is Medtronic’s remote heart monitoring network connecting implanted heart monitoring devices to physicians at remote locations. Given the shift to cities, companies that used to avoid the costs of downtowns are now recognizing that locating in urban areas is vital to attract the best and the brightest. The success of Uber, Zipcar and Lyft reveal the potential for companies that focus on urban consumers. Finally, in a super-interconnected world, establishing a presence in a major hub, depending on industry and domain, is key. This is just a tiny sample of the intuition resets that the authors offer in a book that is as sprawling, complex and fascinating as the world it describes.